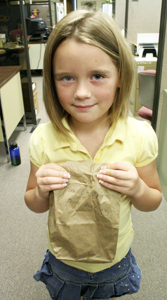 Seven-year-old Mackinley Gabbert stopped by CFCA headquarters in Kansas City, Kan., earlier this month, clutching a crumpled paper bag. The bag contained $18.87 Mackinley had raised over the weekend from a lemonade stand. She wanted to donate the money to charity. After Sponsor Services representative Ruth Hubenthal explained the various options, Mackinley chose to give her money to CFCAís Food Crisis Assistance Fund. †ìI want people to eat and I want them to have a lot of food,î she said. Mackinleyís contribution will help CFCA sponsored members and their families afford the high cost of food. World food prices have risen 83 percent since 2005. Mackinleyís donation could buy a weekís worth of rice for a family of seven in the Philippines. Instead of keeping the money, Mackinley said that giving to people in need made her feel good. She hopes other children will follow her example. Thank you, Mackinley, for setting such a great example! Did you know that children in El Salvador walk 45 minutes and cross a hanging bridge to get to school? Or that students in Kenya literally run to school? Watch this audio slideshow to see how CFCA children around the world get to school. We hope you’ll be inspired by their courage and dedication. Support a child’s education through the CFCA Scholarship program or by sponsoring a child. There is a neighborhood that borders the CFCA center in San Lucas Toliman, Guatemala. The children from the neighborhood wanted to play at the CFCA Center, but they weren’t allowed (out of concern for their safety if they played unattended). Three CFCA finance staff members wanted to help the children find a way they could play at the center, so they organized an environmental club. The environmental club, comprising children from the bordering neighborhood, meets twice a week to pick up litter from the area and recycle it. Then, their bag of trash is their “admission ticket” to play basketball, soccer or educational games at the center. They’re also served a snack. Omar, Sergio and Victor, the organizing staff members, volunteer their time to be with the children during club activities. Now the children are also planting vegetables in a garden at the CFCA center, supplementing their family’s diet and learning organic growing techniques. Here at CFCA headquarters in Kansas City, we were inspired by the children in Guatemala who are making their community a better, cleaner place to live. So, today, on Earth Day, we decided to live by their example. 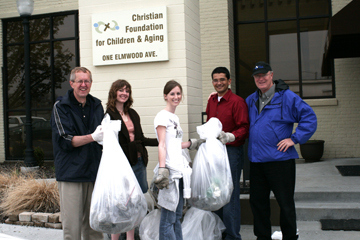 After our weekly all-staff meeting, interested employees walked around the neighborhood where our office is located and picked up litter. It was a great addition to other earth friendly practices we have in place at CFCA. And, it was an opportunity to live in solidarity with our friends and fellow staff members in Guatemala. The children in Guatemala are leading the way—and we’re following.